The Barbed Executioner is one of my more interesting outfits. 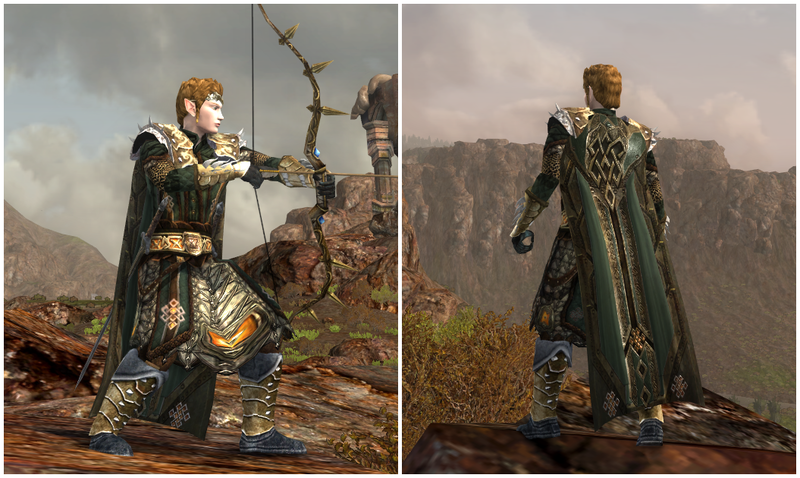 I figured I'd try pairing two distinctly different sets of armor skins and see what I could create. 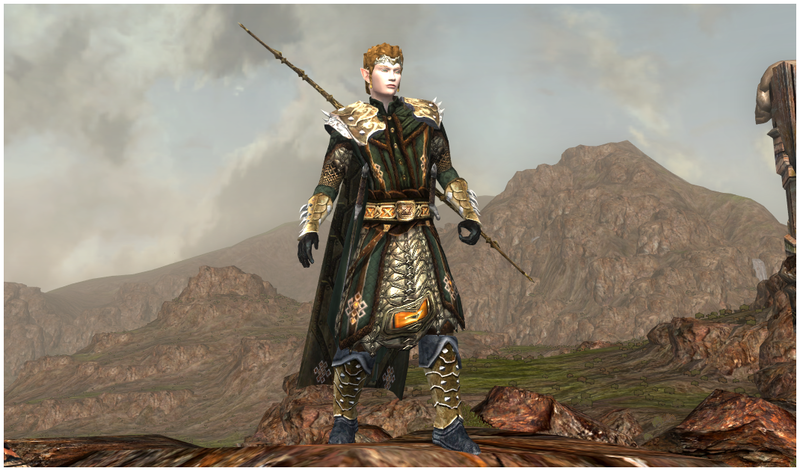 The "Mordor's Bane" and "Mordor's Vanguard" gear from the High-enchanter seldom gets used outside their own sets. Most of those pieces were darkly colored, covered in scales, rivets, shingled plates, and spikes, creating a unique aesthetic. And then there's the dwarven-themed cosmetics from U23, covered in celtic knot-like patterns and intricately weaved leather interlaced with detailed and highly decorated steel. It was a challenge attempting to mesh these styles together and, even though it's not the most realistic appearance, I was satisfied with the result. 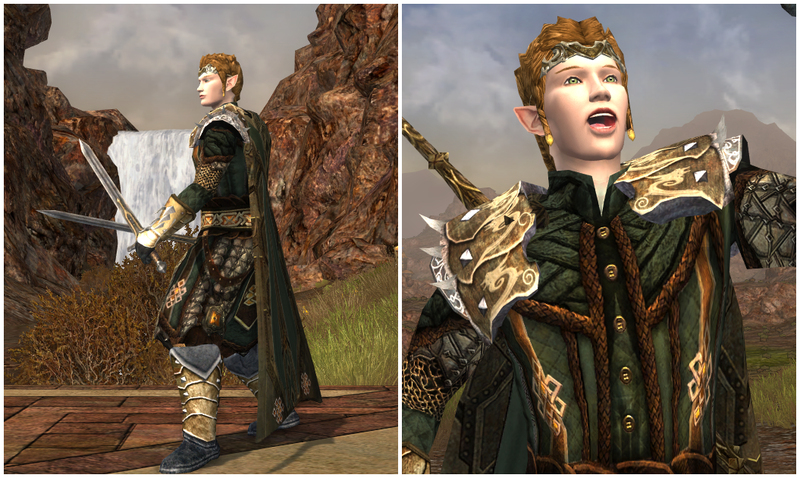 I had only one regret: not finding enough gear with spikes and sharp edges. In hindsight, I probably should have used the Sword of the Steady Mind as an overlay instead. I would have changed it, but my schedule has been tight these past couple weeks. At least I remembered to use the Ornate Lebethron Bow of Speed, which was spot on! I was definitely on a mission, obsessing over barbed gear. Perhaps a little too much! As fun as this was to create, I've sensed the oncoming burnout over the Ered Mithin and Ironfold cosmetics. I've been working them hard these past few months, squeezing every bit of creative use I could find out of them. I still have a handful of outfits ready to go and I love their design, but I've spent a generous of time using them. Until I'm ready to put the U23 skins aside, I'll continue to ride the wave. 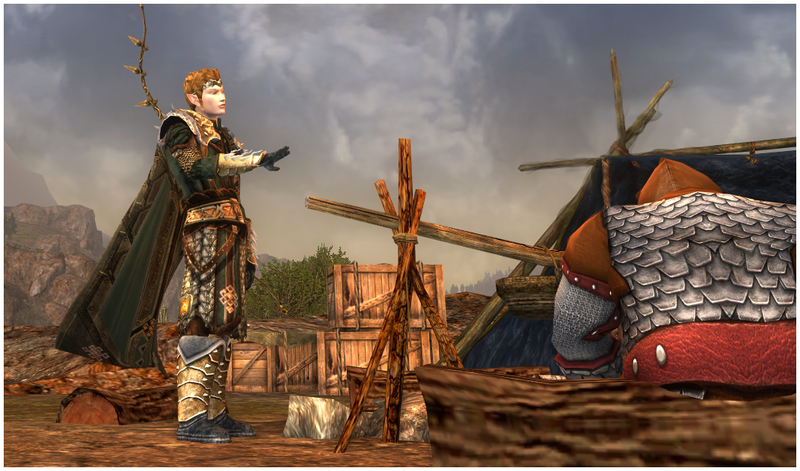 **Also shares the same skin as the Tailor-crafted Hauberk of Stonehelm. I love the hauberk, and I am planning on using it in some outfit sometime lol. It has beautiful detail and looks refined, something that the other pieces are missing as they look more rugged and worn in comparison. The gold dye colour does bring it together nicely. I may try something new with the hauberk in the future. It's definitely a beautiful cosmetic, but the top half feels a little plain compared to the bottom half, which makes it a really interesting design. I can see doing some fun things with other shoulders to balance that. I can't wait to see how you use that chest piece!